“Electronics are beautiful,” says engineer and artist Ayah Bdeir. Through May 12, the windows of the MoMA Design Stores in New York City will feature hypnotic, delightful kinetic sculptures crafted with Ms. Bdeir’s littleBits—tiny circuit boards that snap together with magnets to inspire invention and problem-solving. Engineer and artist Ayah Bdeir challenged Labour, a creative office and workshop, to craft kinetic sculptures for the MoMA Design Stores in New York City. Labour could use only her littleBits, tiny circuit boards that snap together with magnets, and no other hardware or robotics. A partner at Labour prepares an installation in the Midtown windows. Photo courtesy littleBits. The sculptures were made without any wiring or soldering. Here, in the Midtown windows, a miniature cyclist furiously pedals a motor Bit, which spins a Ferris wheel that produces a hypnotizing effect. Photo courtesy littleBits. Ms. Bdeir’s passion is to inspire young people and adults to craft with electronics, and her littleBits have won numerous accolades, like the National Parenting Publications Awards. The structure is made out of laser cut board. In the evenings, the Ferris wheel is aglow with LED lights. Photo courtesy littleBits. 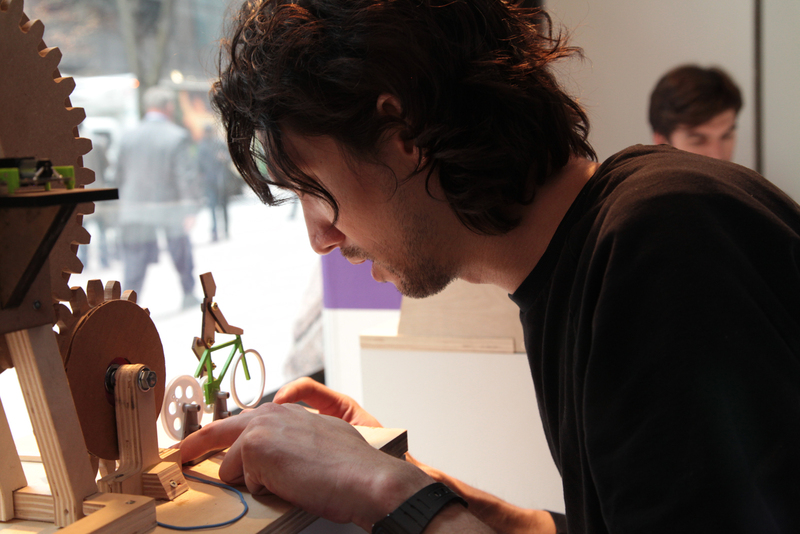 littleBits users have crafted talking puppets, flickering lanterns, and robots that draw. An untitled work of Ms. Bdeir’s made of printed circuit board, analog components, and magnets was included in “Talk to Me,” MoMA’s 2011 design exhibition which explored objects that establish an emotional, sensual, or intellectual connection with their users. Here, a shark is readied for the Soho windows. Photo courtesy littleBits. A brave diver dangles a lure in front of the hand painted shark. The shark is made of acrylic and Bristol paper. Two Bits inside the animal control its undulating movements. The lure is made from a vibrating motor Bit. Photo courtesy littleBits. Installing and inspecting the store window. Photo courtesy littleBits. littleBits is an open-source library of electronics and platform for play. Its community of users upload videos and pictures of their projects. Re-usability is built into the experience: Bits can be used again and again and with simple craft materials. The installations, measuring up to 48 inches tall to the one-inch square littleBits, runs through May 12. Here, a detail of the Soho installation. Photo courtesy littleBits. “So often you see electronics hidden or covered, but I think electronics are beautiful,” says Ms. Bdeir. In the right window of the Midtown installation, toy-sized art handlers try to balance a wobbly frame. A motor Bit makes the frame move from side to side. Photo courtesy littleBits. Brooklyn-based creative office and workshop Labour were challenged to only use littleBits and other craft materials like wood, cardboard, and acrylic. littleBits users have crafted talking puppets, flickering lanterns, and drawing robots. The relationship with the Museum of Modern Art began in 2011—curators Paola Antonelli and Kate Carmody acquired an untitled work of Ms. Bdeir’s made of printed circuit board, analog components, and magnets and included it in “Talk to Me,” a design exhibition which explored objects that establish an emotional, sensual, or intellectual connection with their users. In the exhibition catalogue, they wrote: “like Legos, which allow anyone to understand how to build structures without a complex engineering education, littleBits make a complex process intuitive.” littleBits has also launched “Make Something Big” for enthusiasts. Also, don't miss these two sweet little videos documenting the team's process of designing and engineering a 4 foot robotic sharked powered solely by littleBits!